I spent yesterday at the annual Torrance fiber fest, helping Lois with her booth. Although I took some spending $$ with me, I'd decided before I left that I didn't need, or want, any more fiber. It was going to be a day of talking to fiber peeps and helping them enhance their stashes. Yeah. Right. 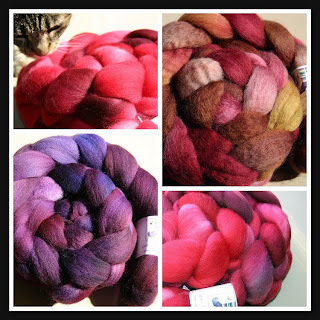 That was before I discovered that Bee Mice Elf, my current absolute favorite purveyor of spinning fiber, was a vendor. I spotted her booth a few minutes before the doors opened to the public and it was very well-stocked. Went back an hour or so later with Ginny and Edie - and almost everything was gone. Obviously, I'm not the only person who was thrilled to see Lars in person. 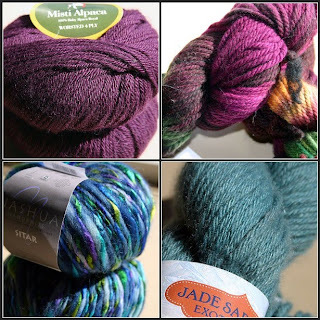 Since I take my payment in yarn, I also came home with this - (clockwise from top) Misti Alpaca to make a woven or Tunisian shawl; Malabrigo Chunky for this hat; Jade Sapphire CASHMERE; and Nashua Sitar to make the same hat for Rach. Not bad for a day's work.